The Post also discovered that many organizations noted they had uncovered fraud, but failed to adequately explain the nature of the diversion, amounts or property involved, and any corrective actions taken. It’s this failure to disclose that’s attracting the attention of the IRS, Congress, and state regulators. “Inside the Hidden World of Thefts, Scams, and Phantom Purchases at the Nation’s Nonprofits” (October 26, 2013) is the lead story with several case studies, highlighting the American Legacy Foundation. 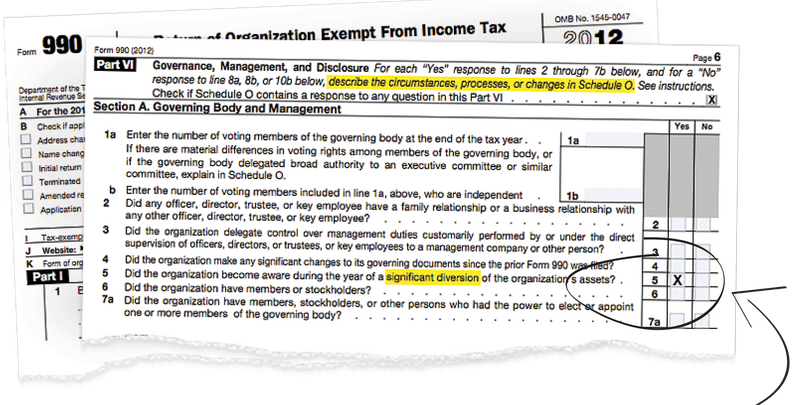 “The Most Intriguing Check Box on a Nonprofit’s Disclosure Form” (October 26, 2013) discusses the common reporting patterns and nonprofit types. “How the ‘Queen’ of High School Rowing Left a Virginia Nonprofit Treading Water” (October 26, 2013). “Millions Missing, Little Explanation” (October 26, 2013) provides a searchable database of nonprofits that have disclosed diversions, built in collaboration with GuideStar. “Something’s Rotten in the State of Nonprofits” (October 30, 2013) are three letters-to-the-editor in response to the initial stories. “Congress Promises Multiple Investigations of Possible Wrongdoing at Charities” (November 1, 2013) describe the efforts of federal and state officials to explore whether nonprofit groups properly reported losses to authorities. “Nonprofits Need Protections From Scoundrels” (November 11, 2013) is an editorial by the Washington Post. “Nonprofit Groups Often Seek Restitution, not Prosecution, When Money Goes Missing” (November 23, 2013) includes a case study of embezzlement by an executive director, who left after being caught but continued to work at other nonprofits. “Maryland Woman Accused of Stealing Millions from DC Nonprofit Group” (November 24, 2013) is a case study of an administrative assistant embezzling funds by creating fake invoices and whose fraud was discovered by the bank, not the nonprofit. “Lawmakers Press IRS Nominee on Reports of Charity Theft, Call for Greater Oversight” (December 12) notes that John Koskinen, President Obama’s nominee to head the Internal Revenue Service, would launch an inquiry into nonprofit organizations that have failed to disclose financial diversions. Thank you for sharing this Max. This is just another illustration of the need for board members to ask tough questions and really scrutinize the financial reports they get at board meetings. Often the Board meeting agendas are so tightly packed and sometimes I think the agendas are set up that way to prevent board members from carefully reviewing and discussing financial issues. This has to change. Alas, most boardmembers of nonprofit have little interest or experience in managing finances. They’re there because of the mission and money is an uncomfortable or inappropriate topic in non-profit organizations. The result is that scarce resources can be wasted and the mission left unfulfilled. Yikes! This is a diversion of about 99% of funds raised. Not sure why it took the Attorney General so long to put a stop to this (and how unaware the board was).